From the Mother Earth News Fair, we hear about Life on the “Farmstead.” Lisa Kivirist turning your dreams of small scale food into a living in Wisconsin. Lisa has tips for us all. Then we go solar with author and speaker Dan Chiras, plus solar electrician Brad Burkhartzmeyer – the questions you would ask are answered. There were so many useful angles to this interview. For one thing, we learn about the transition out of the city. But what will you do there to survive and pay the bills? Lisa and her husband John Ivanko managed a balance of food production, local business, and book writing – successful for the past 17 years. They’ve developed and then written about “ecopreneurship” – developing an income from what you love to do – and what is good for the Earth. Oh and by the way, Lisa and John run a “carbon negative business”. They soak up more carbon than they emit. Isn’t that the only way to a future? Their latest book is “Rural Renaissance: Renewing the Quest for the Good Life“. 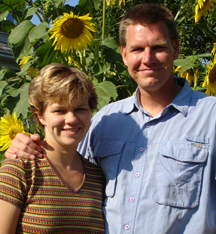 If you want to learn from this dynamic couple personally, book into their top-rated green bed and breakfast outside Monroe, Wisconsin. Find their web site here. Just one of the many tips that impressed me: setting a time after the Christmas feasting to really eat up all those supplies you bought in bulk, or stored away from the previous season. A time of buying no food, but working up good recipes from what you have. Linda is an experienced and engaging speaker, and we had some laughs along the way. Enjoy this one! Radio Ecoshock continues from the Mother Earth News Fair in Puyallup Washington. Does it pay to go solar? Dan Chiras worked alternative energy for three decades, writing 30 books in the process. Dan visited me in the Radio Ecoshock mobile studio. Dan is a 30 year veteran of the battle to bring clean green energy to America. Currently he’s the Director of the Evergreen Institute located in Gerald, Missouri. Dan also has two blogs in Mother Earth News magazine. His first blog is on building Net Zero energy homes. In fact, if you search for “Dan Chiras Net Zero Energy” you’ll land in his Mother Earth News blog. Or you can go to the Mother Earth News web site and find the blog here. One of Dan Chiras’s many books that appealed to me was “Things I Learned Too Late in Life“. His second Mother Earth News blog is called “Dan Chiras on Loving Life”. It may sound corny, but Dan thinks a positive love for people and all Nature can be healing for the planet. Behind all that, are mountains of books, articles, You tube videos, and public appearances by Dan Chiras – absolutely crammed with plans and tips to install everything from solar to wind and beyond. In our interview, we concentrated on solar energy. One of our previous off-grid guests suggested the real place to start is not solar electricity, but “solar thermal” even just to heat hot water for your home. We talk through all that, and Dan gives us a lot in a short interview. We just have time to squeeze in a few minutes with a very experienced solar designer and installer from Washington State, Brad BurkHartzmeyer. Brad founded Sun’s Eye solar power which has installed lots of solar juice in area of Tacoma Washington, and beyond. It becomes apparent during our interview the importance of checking out the training and credentials of your solar installer. Maybe the guy down the road is not your best choice. Some states require a trained electrician, with more courses on solar installation. Others do not. Buyer check it out! In the program I only had time for just a sample from my full 18 minute interview with Brad Burkhartzmeyer. We talk about roof angles, solar water heating and more. Get the full interview as a free mp3 download here. If you’ve ever considered solar power, give that interview a listen. At one point I was wondering. Brad suggested the average full solar power system costs between twenty and thirty thousand dollars. Twenty thousand for a solar system? No way I thought. Then I get in my $25,000 car which will break down in three years and costs thousands to run every year. Maybe a lifetime supply of sun power would be a better buy. Plus, the system will pay for itself, and can even turn a profit, if your local provider allows meters that can run backwards, paying you for the extra power you produce. A nice check coming in. We know electricity rates will just go up and up. With solar you get a guaranteed low rate, which just gets more competitive as time goes by. At the Mother Earth News Fair, the whole mobile radio studio was powered by the sun. Join me won’t you, in the clean energy revolution? You can help support this program, at our web site, ecoshock.org. My thanks to listeners who made it possible to record so many great guests at the Fair. I’m Alex Smith, saying there’s lots more Radio Ecoshock coming next week. Let’s meet again then. We finish up the program with a small slice of sun-loving music by Vastmandana, out of Oakland California. Alex, Love your podcast, and all that you do. Keep up the great work!